Question: Which do you think is the better song? Both are great songs of the possibly one of the greatest era of music, but I'd take Bridge Over Troubled Water this time. Maybe You've Got a Friend has more emotion put into, but in terms of production Bridge Over Troubled Water is something else. THAT harmony, and that drum. Now, which do you think is the better song? Curious to know how you think? No contest here. James Taylor's song is nice, but Bridge Over Troubled Water is a masterpiece. Will have to think this over! I love BOTW. Great production and Art Garfunkel is supurb. There were two versions of YGaF that came out about the same time. I really liked them both but as the years have gone by I've come to love Carole King's version much more. Two great songs. Will make decision tomorrow. Made decision. Both great songs but went with Bridge over Troubled Water. Difficult! I heard "BOTW" way, way too often at the time. But like KDS and Elizabeth, I eventually went for the masterpiece of composition, performance and production that is "Bridge Over Troubled Water". The band called Half Man Half Biscuit was always good for hilarious album titles. Achtung Bono was one and another was Trouble Over at Bridgewater. 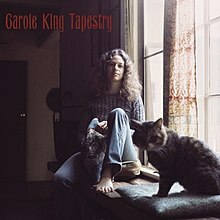 Carole King makes boring Tapestry, album chockful of weak samey material sung in laughably bad voice, yet she gets Grammy. BBs, THE BEST vocal group, didn't get Grammy. Bottom line: Grammy=biggest joke in music industry. Haha! Dislike BOTW but Paul Simon is miles better. Bottom line: Grammy=biggest joke in music industry. Haha! Do agree with you about the Grammy awards. Thanks to sleep deprivation, I just noticed that I listed James Taylor (I actually prefer his version). But, Carol's version also pales in comparison to the masterpiece that is Bridge Over Troubled Water. The fact that BB and its members couldn't receive grammy until 2004 (except for I Write the Songs) says something. Right, and the Grammy was for an instrumental. The founder of the greatest vocal group in history wins a Grammy for an instrumental? But, the Grammys are also notorious for handing out awards for live versions of decades old songs just to say they gave awards to legacy acts like Iron Maiden, Judas Priest, etc. I remember seeing a video of the 2012 era Beach Boys. They were discussing the Grammy Awards and that Good Vibrations lost for 1966. Brian acted surprised and asked what song won. When told it was a Mamas and the Papas song his reaction was priceless. Don't know if he was pulling their legs or if he had truly forgotten that GV didn't get a Grammy but it was so funny! did TWGMTR get any nominations? It seems like whenever a big name legacy artist releases an album now it gets a token nomination. That's true. I remember when Dylan's TOOM got Album of the Year in 1998. Great album, but where were the Grammy voters when he did Highway 61, BoB, BOTT, or Desire? No song wins when compared to "Bridge." If you vote for the other song, Art's beautiful voice will come to haunt you in the night. BOTW is a masterpiece in every respect and would stand up against songs from any year. YGAF is a nice little song, so much better in the hands of James Taylor., but not in the same league by any metric. YGAF isn't "nice little song", it's further - boring nice little song. The entire Tapestry can be described like that. My goodness! OK, I'll agree about Tapestry and CK's version of YGAF, but JT's version elevates it significantly, IMO, way out of the "boring" range. Never understood Carole King's success, and really hated when she an Taylor toured together a few years ago. Mega-Props to her, though, for writing "Will You Still Love Me Tomorrow." Tapestry and Mud Slide Slim came out in my early High School days and I had both albums. At the time I probably was more of a James Taylor fan but came to appreciate Carole King more later. As for Ms King's voice, it doesn't bother me (just as Bob Dylan's doesn't). She wrote many great songs. No. Don't care about James Taylor either. Powered by SMF 1.1.21 | SMF © 2015, Simple Machines Page created in 0.081 seconds with 23 queries.